As Staff Sgts. Larry Knoll and Ace Jones drove down the dirt road, the knobby tires of their all-terrain vehicles kicked up huge clouds of dust. Goggles, strapped over their Kevlar helmets, covered their eyes. They wore gloves and heavy flak vests, over which an assortment of gear hung from the belts of their load-bearing equipment. And they had stubby M-4s, the latest type of M-16 assault rifle, slung over their shoulders. The security forces airmen wore the tools of their trade. Friends and partners, they knew well how to handle their steel, plastic and rubber steeds on the bumpy road at Bashur Airfield, Iraq, an outpost 255 miles north of the Iraqi capital of Baghdad. They stopped near a row of tents, got off their vehicles and dusted themselves off. Around them, airmen sat on cots outside their canvas abodes, chatting and spooning down Meals, Ready to Eat. And after a long day on the job, the rations were looking mighty tasty to Knoll and Jones. But after 14 hours on the job, there was a chance they might not get any rest. At any moment they could get the call to switch to their other persona, snipers. Not the kind in Hollywood movies who sneak into the countryside to spend weeks stalking an enemy for that one shot, one kill moment. No. Knoll and Jones are quick to say they’re, first of all, security troops whose job is to protect their fellow airmen. “We’ll do whatever it takes to keep our troops safe,” said Knoll, of Saratoga Springs, N.Y.
At Bashur, the hub of the Air Force airlift into northern Iraq at the peak of Operation Iraqi Freedom, that meant doing “grunt” work. Going on perimeter and off-base patrols, standing guard at entry control points and building defensive firing positions. Not a problem. It’s exactly what the pair trained to do. What they expected when they joined the Air Force to be security troops. They love the lifestyle. Plus, when they volunteered for duty with the 86th Contingency Response Group, they knew that to really do their job they’d have to be at a bare base in the middle of a fight somewhere. They’re in a unique unit, the only one in the Air Force. The group’s job is to be the first to land at a bare base to establish airfield and aerial port operations, pronto. The 786th Expeditionary Security Forces Squadron, where Knoll and Jones work in operations, provides the security. The cops keep airmen safe as they land, unload and launch aircraft around the clock. 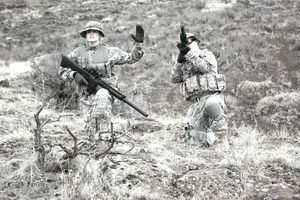 Knoll and Jones never stopped scanning the surrounding mountains, an instinct they’d developed during sniper training. With a sniper’s sharp eye, they looked for an unseen enemy. A mobile and elusive foe who, if unstopped, could attack and kill squadron mates and cause havoc with flight operations. The sniper team hoped to put their training to the test. So, they kept their long-range rifles and Ghillie camouflage suits ready. In minutes, they could gather their gear and silently skulk off into the mountains in search of a target. But in the close-knit rural communities around the airfield, the Kurdish people knew their friends and neighbors well. New faces are easy to spot. So news of a stranger travels fast, easily reaching friendly intelligence operatives in the area. It's the intelligence people who give snipers their targets. But the local eyes and ears helped deter Iraqi troops and terrorists from sneaking in and taking shots at Bashur. But the war on terrorism isn't a precise operation. Terrorists are unpredictable and strike quickly, making attacks hard to stop, Jones said. And Bashur's key mission ensured it would be under constant threat as long as the war with Iraq continued. "We'll continue doing our regular jobs," said Jones, an 11-year vet from Wake Forrest, N.C. "But we've got to be ready to switch to sniper mode, to eliminate any threat before one of our people gets hurt." Knoll and Jones have been a team for more than two years. They've honed their craft through extensive training. They stay ready and can gather their sniper's kits and be on the prowl in minutes. They knew their main target would be a bad guy carrying a shoulder-fired missile. Its why they kept an eye on the mountains. Because just one rocket fired from any of the surrounding peaks at their tent city could cause massive injuries. And if a missile hit a cargo plane, it could stop all air operations into the strategic 7,000-foot runway. That wouldn't have been good, to say the least. Because during the height of the operation to liberate Iraq, more than 366 C-17 Globemaster III and C-130 Hercules transports dropped off more than 23 million pounds of cargo at the airfield. Most planes arrived at night, loaded to the gills with supplies and equipment. Airmen ran to unload them by the dim green light of their night vision goggles. The nearby mountains echoed with the noise of plane engines. And the group ran blacked out operations to add another layer of security to the Bashur night. Knoll and Jones knew they might have to do their job in the dark. No matter, they said. "Day or night, our job is to take out a target before he can fire at one of our multimillion dollar aircraft or kill someone," Knoll said. So missing a shot isn't an option. Anything less than a confirmed hit does little to diminish the threat to the airmen on the ground. But if the exacting code of their work put extra pressure on the snipers, it didn't show on their faces. "You just make sure you don't mess up," Knoll said. But "mess up" isn't in their vocabulary. They know their talents are in high demand. That the mere rumor they're on the battlefield can send shivers through the enemy ranks. "Snipers are the biggest psychological deterrent on the battlefield," Knoll said. They're also the most hated troops in a combat zone. So snipers must stay focused on the mission and what they're doing to survive, he said. "We can't make a mistake," he said. "Too much is at stake. Besides, how many snipers have you heard of who have come back from a prisoner of war camp?" Knoll and Jones accept the responsibilities of their job and the risks. They knew what they were getting into when they joined the contingency response group, with its headquarters at Ramstein Air Base, Germany. Their squadron is at nearby Sembach Air Base. When they arrived, there were six snipers. But for the past two-and-a-half years, Knoll and Jones have been the only two. Their desks are across from each other, and they train together. They're pals off the job, too, so they know each other well. Both went through the Army Sniper School at Fort Benning, Ga., a month apart. They also went through the Air National Guard-run countersniper school at Camp Joseph T. Robinson, Ark. But it's the five-week course at the elite Army school that makes them valuable to the group. They learned advanced marksmanship skills, to measure wind effects and estimate the range of targets. They also learned to detect, track and stalk targets, counter-stalking, and camouflage. And they learned to select sites for, and set up, forward-listening and observation posts, also mastering how to stay undetected in them. That gives the contingency group commander an option on how to best use the snipers. The commander can keep them at the airfield to beef up force protection or provide countersniper fire - or send them to patrol nearby ridgelines. The long-range patrols, which can last a few days, are to find bad guys with the shoulder-fired surface-to-air missiles. These weapons can threaten aircraft from as far away as six miles. "We patrol well past the front lines, so we can take out a target well before it can threaten our aircraft or people," Knoll said. "We have to keep a sharp eye open all the time." Once on the hunt, the longer the shot, the farther away snipers are from trouble. So Knoll and Jones spend hours at the shooting range firing and mastering their M-24 sniper rifles. It's a military modification of the Remington 700 hunting rifle. "We practice as a team, so we know how each other works," Jones said. The teamwork paid off at the Army school, where snipers must fire from 400 to 600 rounds at targets ranging from 12-inches to 20-inches in height. They shoot from various distances and in different situations. Sometimes they knew the distance to the target and sometimes not. And they must hit moving targets during the day and at night. To pass each phase, snipers must hit 14 targets. Knoll and Jones did better. "We hit 18 or 19 targets consistently," Jones said. "We pride ourselves on being good shots." Both have hit targets at more than 1,000 yards. But at Bashur, neither Knoll nor Jones took a shot. They continued to train and went on long patrols, but they didn't go on a real operation. They wished otherwise. They did have some excitement though. Knoll and Jones, and 18 other group airmen, parachuted into Bashur with 1,000 paratroopers of the 173rd Airborne Brigade from Vicenza, Italy. The soldiers secured the perimeter while the airmen secured the runway and established air operations. It was a historic jump, and 14 of the Air Force jumpers were security forces. The airmen were the Air Force's first-ever conventional forces to parachute into a combat zone. And the huge C-17s that dropped them were on their first combat parachute mission. "We'd just come home from a deployment and had four days to repack to stage for the jump into Bashur," Jones said. "It was exciting, though we didn't know what threat to expect." Luckily, a real Iraqi threat never materialized. Still, Knoll and Jones cleaned their rifles and maintained their Ghillie suits, adorning them with bits of rags, strings, and local plants to blend in with the countryside. They worked around the clock, up to their necks in the security forces jobs they'd trained to do. But they weren't disappointed. "When I found out I was jumping into Iraq, I was stoked," Jones said. "I couldn't wait to get to Iraq and do my job. And that's just what I did." Knoll was confident he and Jones could take to the mountains to stalk an enemy. But when that didn't happen, they continued their force protection job. "That was our main concern, anyway," Knoll said. "But if they needed us as snipers, we're ready to eliminate any threat that might pop up."